Where is time going? In just under 2 weeks, I will be finished year one of culinary school. 11 more days, only 8 of which are actual school days. It’s weird because it feels like just yesterday I was saying goodbye to my parents and sister at the airport as they headed back to Calgary without me. But at the same time it could have been 5 years ago. Heck, did it even happen at all? Time. So hard to gauge yet so easy to take for granted. In fact, now seems like an appropriate time to do a brief recap. To catch you up to speed, my year was divided into rotations. Each was part of a 23 day cycle during which all food produced was used in a cafeteria style lunch buffet (customers being primarily students, however lots of locals came (come) to sample our offerings). Ok rotation #1. Unfortunately it was actually the only rotation NOT in the kitchen. Instead the culinary industry essentials course taught just that. We learned about different career opportunities, explored how our food is produced and even went on a few field trips. I won’t sugarcoat it, I just wanted to get in the kitchen so it was a bit rough. It was also the school’s first year implementing such a course. Being the first class through, we were basically the guinea pigs. I’m sure it would be interesting to sit in on a class now just to witness the changes that have occurred over a 7-8 month period. Only on PEI does one make an impromptu stop at a wild boar farm. From there I moved into breakfast and butchery. Or the introduction to 6 AM shocker classes! I’m a morning person so I didn’t mind. Although I don’t miss the smell of raw meat first thing to start my day. That being said, I learned a ton. Everything from filleting salmon and halibut, to deboning entire pork loins, to 8-cut chicken. Definitely not skills you can pick up from watching Food Network. Who knew there is so much to learn about meat? This is only the tip of the iceberg. After rotation #2 school went on hiatus for Christmas break. Then we were back into the 6 AM routine for baking. I’ve got to say this was by far my favorite rotation. There’s just something about baking. Without getting overly “zen” or whatever you want to call it, I will say only that I find create comfort in something as simply as a fresh loaf of bread. Or muffins, cookies, cake, etc. Especially knowing that you made it with your own hands. For baking part of our mark was based upon a “blackbox” exam. Everyone drew a country out of a hat, then you had to make either a dessert or bread from that region. 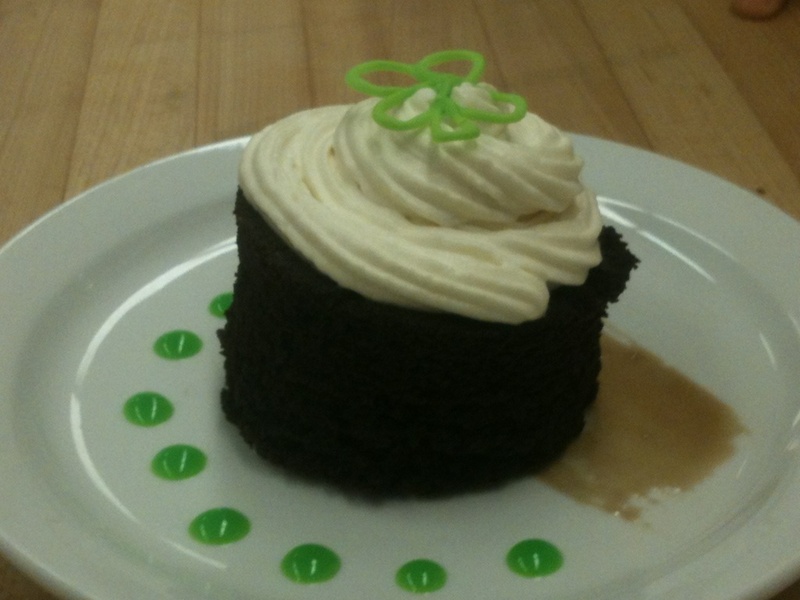 I chose Ireland so I decided to center my dessert around Guinness. Next, entremetier and cold cuisine (I believe we are now at rotation #4 if you are trying to keep track). We produced all of the starch and veg for the cafeteria as well as daily feature sandwiches (which was the blackbox for this rotation). 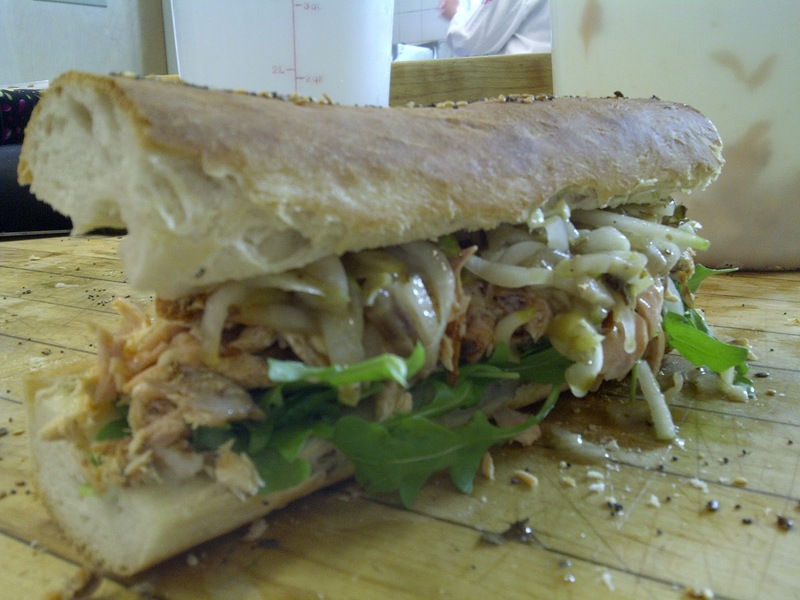 My partner and I created one with hot smoked salmon and char, gorgonzola mayo and Anjou pear slaw. The chef was pretty open to experimentation as long as you finished everything you had to do otherwise. So one day I decided to make compressed watermelon just for shiggles. It definitely would have been better if the watermelon was actually ripe and sweet to begin with but a cool concept nonetheless. Production was rotation #5. It was our responsibility to take all of the food that the other groups prepared, heat it up and serve it on the line. In addition to this we also had to make pizza and the daily speedline special (people actually had to order this separate, it was not part of the buffet). And now to finish things off, it’s soups, stocks, sauces. Pretty self-explanatory right? Wrong. Nah, I’m just messing with you, it’s pretty self-explanatory. In soups we make 2 per day. There’s broth soups and thick soups (this category being composed of both cream-based and pureed varieties). For stocks, there are 2 basic types; white and brown. The primary difference is brown stocks require roasted bones and mirepoix (aromatic vegetables usually carrots, onion, celery and often leeks as well) as well as tomato paste for color. From there you can make chicken stock, beef stock, veal stock, lamb stock, pork stock, fish stock, vegetable stock, cat stock, dog stock. Perhaps not the last 2 but you get where I am going, right? You can make stock out of everything and anything (within reason people, within reason). I won’t judge though. Clearly my reason is a tad skewed as I sit hear eating chocolate at 10 in the morning. Mallory, Mallory, always getting side-tracked. Sauces. To give you the low-down, there are 5 basic “Mother” sauces in the classical French repertoire. Everything else (well almost everything) derives from these. Hence they are called “derivative” sauces. 3 out of the 5 Mother sauces are thickened with “roux”. This is a mixture of equal parts butter and flour by weight. It’s also the reason that you have to cook the sauces for a bit, to get rid of the pasty flour taste and allow all of the flavors to meld. Oh and there are different colors of roux depending on how long you cook it for, before adding the liquid that you want to thicken. White roux is cooked the least and is used for white sauces. Blond roux is next, followed by brown roux (for brown sauces). 1. Bechamel – milk thickened with white roux. 2. Veloute – white stock (veal, fish or chicken) with white or blond roux. Each of the 3 is THEN split into derivatives. Information overload anyone? 3. Espagnole (Brown Sauce) – beef/veal stock thickened with brown roux and flavored with mirepoix and tomato paste. 4. Tomato Sauce – A mix of tomato puree, paste and white stock, flavored with mirepoix and herbs and pureed. No starch thickeners. Now that’s what you call food for thought! Holy smokes. I now have a completely new appreciation for the saucier! My word. That is a LOT to learn. I thought the sous chef did all the sauces, but apparently, it requires a job entirely of it’s own! It all depends on the size of the restaurant. Yes, typically the saucier is responsible for sauce cookery but if it’s a small kitchen, chances are everyone participates in every aspect. Really, it’s not too difficult once you get the hang of it. When you look at it, bechamel, veloute and espagnole are the exact same sauce with different colored rouxs and different liquids. Same basic method though. Not to mention they are extremely classical and not necessarily used in every kitchen you will enter nowadays.